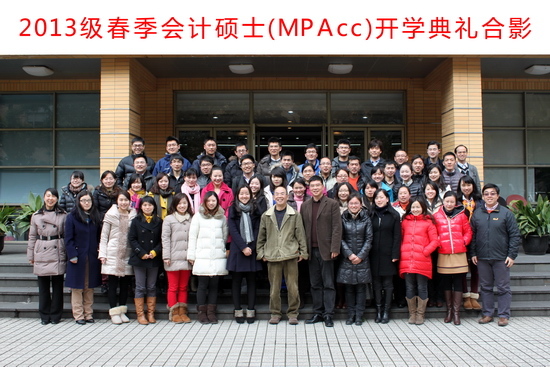 A grand opening ceremony of MPAcc 2013 Spring was held on March 2nd. Prof. Chen Yamin (director of the MPAcc/MAud program), Prof. Xu Xiaodong (deputy director of the MPAcc/MAud program), Ms. Mo Haowei (course instructor and corporate tutor of MPAcc/Maud program, and KPMG staff), and Mr. Xiang Dalong (Global Chief Finance Officer of Owens Corning) attended the ceremony. 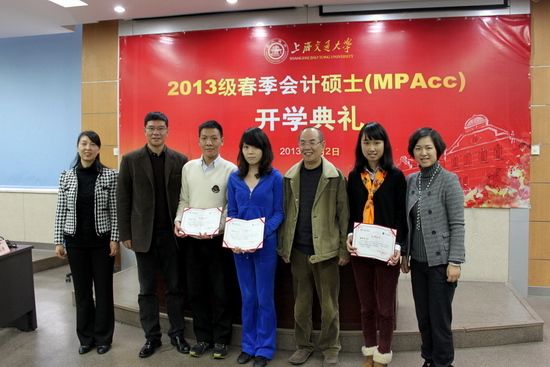 Ms. Zhang Qian, staff at MPAcc Office, hosted the ceremony. The opening ceremony started with National Anthem sung by all the people present. 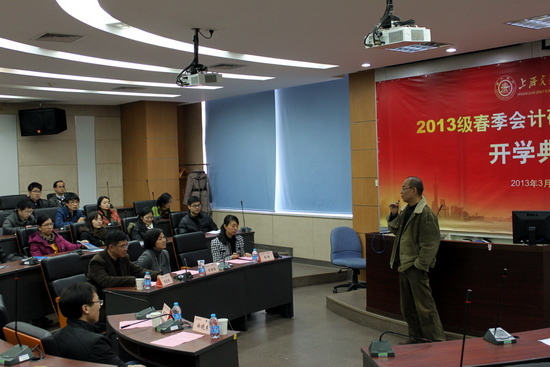 Then, Prof. Chen Yamin made an opening address. 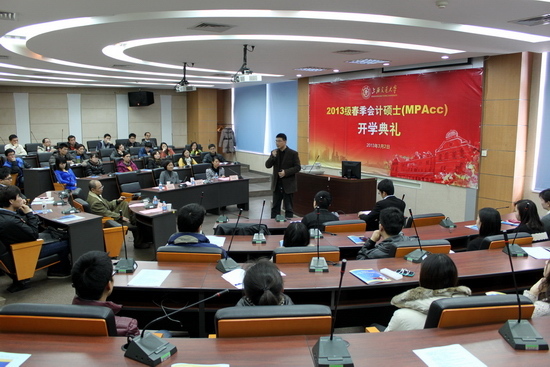 Prof. Chen praised MPAcc candidates for being proactive in study and pursuing self-worth, encouraged students to broaden their horizons and to pursue their life goal by making full use of the learning opportunities on SJTU MPAcc/MAud program, in the context of booming China’s economy and capital market. Ms. Mo Haowei made a speech about her career development through 18 years’ experience in auditing profession. She encouraged students to improve professional and comprehensive quality and to realize their life goals via study in SJTU. Mr. Xiang Dalong also extended congratulations and expectations to MPAcc candidates. 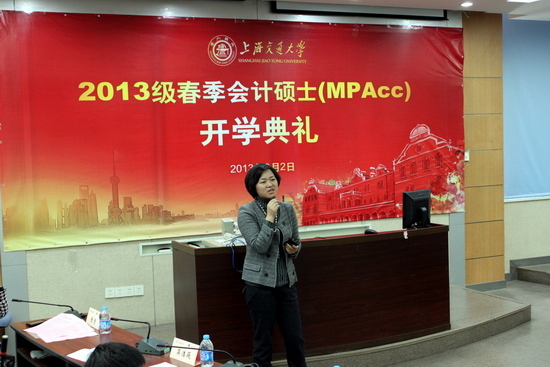 Mr. Luo Xudong (monitor of 2012 part-time MPAcc class) and Mr. Lin Shengyu (monitor of 2013 part-time MPAcc class) also made speech. Mr. Lin, partner of Lixin Accounting Firm, expressed his feelings on behalf of all the freshmen of MPAcc candidates. He said that although the 56 freshmen came from different industries and different regions, they applied for SJTU with the longing for learning, enquiring and understanding “Dao” (a system of knowledge, practices, morals and values) and with the hope of “Becoming a first-class talent”. They were proud that they got enrolled. They were looking forward to experience the rigorous teaching style and fantastic learning atmosphere in Antai College in the following two years of study. Although part-time MPAcc candidates were faced with challenges to handle work, family and study in the same time, they would strive to be an outstanding accountant with profound knowledge and decent manner. Prof. Chen, Ms. Mo and Mr. Xiang presented Freshman Scholarship certificates to the prize winners, Sang Yanjun, Zhao Yuyan and Dong Lili. Later in the freshman orientation, Ms. Zhang Qian and Mr. Lin Feng gave detailed explanation of score and school roll administration of part-time graduate students as well as the key points in student handbook. The opening ceremony came to an end with Antai theme song. The fabulous campus life of 2013 part-time MPAcc candidates would start and reveal an excellent future for them.